In 1982, Barbara Vucanovich became the first Nevada woman elected to federal office. At the time, Vucanovich represented one of the biggest districts in the country, covering nearly the entire state. Winning her first elective office at the age of 61, the former business owner and congressional aide won an influential seat on the Appropriations Committee (eventually chairing the Military Construction Subcommittee) and served seven terms in the House of Representatives. Barbara Farrell was born on June 22, 1921, in Fort Dix, New Jersey, to Thomas and Ynez Farrell. Public service was a part of her life from an early age.1 Her father was the chief civil engineer for New York under Governors Al Smith and Franklin Roosevelt. Her mother had been a volunteer ambulance driver in World War I. Barbara Farrell was raised in Albany, New York, graduating from the Albany Academy for Girls in 1938. She attended the Manhattanville College of the Sacred Heart from 1938 to 1939. In 1949, the family moved to Nevada. On March 8, 1950, Barbara Farrell married Ken Dillon and they settled in the Reno area in the northwest part of the state. The couple raised five children: Patty, Mike, Ken, Tom, and Susan, before her husband died in 1964. Barbara Farrell Dillon married George Vucanovich on June 19, 1965. While raising her family, Barbara Vucanovich also owned and operated a speed reading school and a travel agency. Vucanovich’s first experience in politics came in 1952 when she served as a delegate to the Nevada state GOP convention. Three years later, she won a one–year term as president of the Nevada Federation of Republican Women. She worked for Republican Paul Laxalt for nearly 20 years while he served as Nevada’s lieutenant governor and governor. When Laxalt won election to the U.S. Senate, Vucanovich worked for him as manager of his district office and as a campaign adviser from 1974 until 1982. It was in that capacity that she learned the nuances of constituent service, a skill that even her opponents admired. One observer noted Vucanovich “is good with people, and she can think on her feet talking to them.”2 In 1976 and 1980 she served as a delegate to the Republican National Convention. 1United States Capitol Historical Society (hereinafter cited as USCHS) Women in Public Service, videocassette (Washington, D.C.: U.S. Capitol Historical Society, 1998). 2Deborah Churchman, “Nevada Congresswoman Barbara Vucanovich Brings Care, Warmth to Washington,” 1 February 1983, Christian Science Monitor: 18. 3James Gerstenzang, “President Plugging for GOP Candidates in Nevada,” 6 October 1982, Associated Press. 4Tom Raun, “Election ’82: Nevada Race Offers Clear Test of Reaganomics,” 26 October, 1982, Associated Press. 5Joseph Kraft, “In Nevada, a Turn To Wine and Cheese,” 21 October 1982, Washington Post: A19. 7Almanac of American Politics, 1994 (Washington, D.C.: National Journal Inc., 1993): 786; “Election Statistics, 1920 to Present,” http://clerk.house.gov/member_info/election.aspx. 8“Barbara Vucanovich,” Associated Press Candidate Biographies, 1996. 9Politics in America, 1994 (Washington, D.C.: Congressional Quarterly Inc., 1993): 935. 10USCHS, Women in Public Service. 11Steven V. Roberts, “Panel of G.O.P. Concludes Draft of ’84 Platform,” 17 August 1984, New York Times: A1. 12“Handguns and Money,” 3 March 1986, Washington Post: A9. 13“Barbara Vucanovich,” Associated Press Candidate Biographies, 1996. 14Almanac of American Politics, 1994: 786. 15Congressional Record, House, 102nd Cong., 2nd sess. (28 May 1992): 3839. 16Congressional Record, House, 101st Cong., 1st sess. (18 September 1989): 5694. 17“Vucanovich to Retire from House,” 6 December 1995, Washington Post: A8. 18“Vucanovich: Ex–Rep. Has Officially Gone Postal,” 10 October 2000, The Hotline. 19"Barbara Vucanovich, First Woman Elected to Congress in Nevada, Dies at 91," 10 June 2013, Reno Gazette-Journal, http://www.rgj.com/article/20130610/NEWS/306100037/Barbara-Vucanovich-first-woman-elected-Congress-Nevada-dies-91 (accessed 10 June 2013). Papers: In the George John Vucanovich Papers, ca. 1910-1998, 4.5 linear feet. Persons represented include Barbara Vucanovich. Papers: 1982-1996 (bulk 1989-1996), 86 cubic feet. 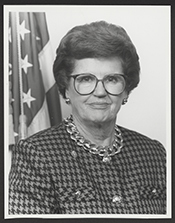 The collection of Barbara Vucanovich contains congressional papers and correspondence, including press clippings and releases, Appropriations Committee files, staff files, legislative files, campaign materials, Commission on Presidential Debate materials, office administrative files, and photographs. Also included are portraits, video tape, sound recordings, memorabilia. A finding aid is available in the repository. Restricted. Papers: In the Patricia D. Cafferata Papers, 1958-1992, 14 cubic feet. Persons represented include Barbara Vucanovich. Videocassettes: 1984-1988, 8 commercials on 2 videocassettes. The commercials were used during Barbara Vucanovich's campaigns for the 1984 and 1988 U.S. congressional elections in District 2 of Nevada, Republican Party. "Barbara F. Vucanovich" in Women in Congress, 1917-2006. Prepared under the direction of the Committee on House Administration by the Office of History & Preservation, U.S. House of Representatives. Washington: Government Printing Office, 2006. Vucanovich, Barbara. "A Conversation with Jefferson." In A House of Ill Repute, edited by Dan Renberg, 70-75. Princeton, N.J.: Princeton University Press, 1987. Vucanovich, Barbara F. and Patricia D. Cafferata. Barbara F. Vucanovich: From Nevada to Congress, and Back Again. Reno: University of Nevada Press, 2005.